Following the conclusion of RESISTANCE’s landmark 8-week residency at Privilege Ibiza and ULTRA Worldwide’s biggest tour of Asia to date this month, the world’s most international festival brand now gears up for a staggering ELEVEN separate events, in NINE countries across Central and South America, from October 6-15. 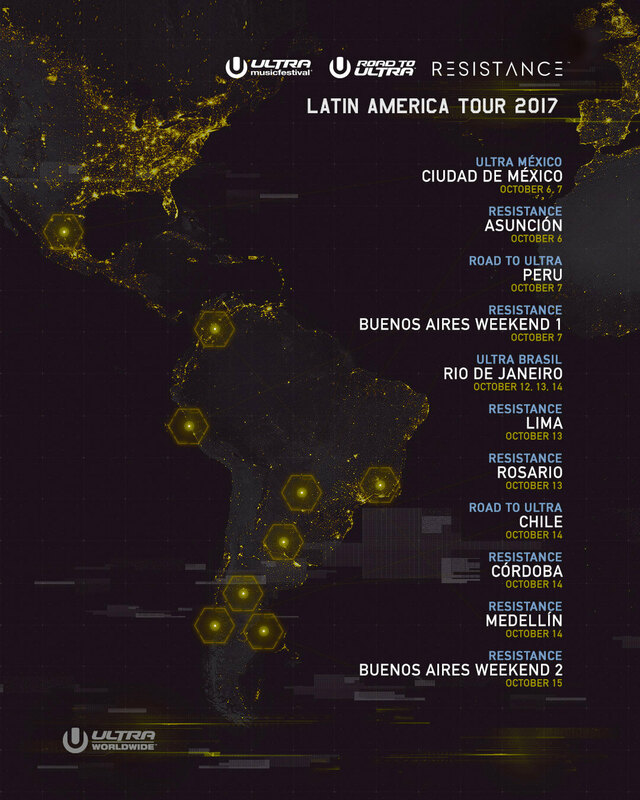 In addition to the debut edition of ULTRA Mexico and the second annual edition of ULTRA Brasil, RESISTANCE shows will run in eight countries across nine dates in October, while Road To ULTRA events will take over the beautiful cities of Lima and Santiago on consecutive weekends. Featuring performances from Adam Beyer, Jamie Jones, Joseph Capriati, The Martinez Brothers, Nic Fanciulli, Paco Osuna, Pan-Pot, Richie Hawtin, Sasha | John Digweed, Seth Troxler and many more, RESISTANCE will produce standalone shows in Asunción, Buenos Aires (x2), Lima, Rosario, Medellín and Córdoba, as well as dedicated stages at ULTRA Mexico and ULTRA Brasil. Road To ULTRA Peru is the first RTU event of the year in South America, and is scheduled for October 7 at Club Cultural, a new venue to last year’s party. Headliners for the event include Afrojack, Alesso, and Nicky Romero, who will be joined by Feed Me, Malaa, and The Zombie Kids. Road To ULTRA Chile returns to the Movistar Arena on October 14 having just announced headliners Alesso and Marshmello. Support will see Feed Me and Malaa take the stage in Santiago, for ULTRA Worldwide’s fifth straight year of events in Chile. Full lineup details and dates for all upcoming Road To ULTRA and RESISTANCE events can be found below.